Less than one-quarter of marketing departments coordinate their multichannel efforts, but Teradata aims to make omnichannel effortless with an update of its marketing cloud solution. 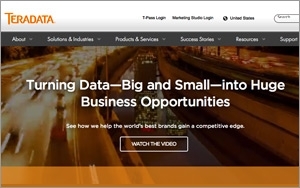 Teradata Marketing Applications, a division of big data company Teradata, today announced an updated version of Teradata Integrated Marketing Cloud. The new data marketing solution claims to improve customer engagement and increase revenue by unifying customer experience across paid, earned and owned channels. The new data capabilities are partially derived from Teradata’s September 30, 2015 acquisition of database management provider FLXone. Teradata Integrated Marketing Cloud may be of special interest to email marketers, which can now leverage better customer data and real-time interactions to create more personalized messaging. New email marketing features include advanced segmentation capabilities, psychographic and geographic targeting, social integration, and mobile optimization. It also features a self-learning content creating engine to help marketers achieve higher clicks and conversions through more personalized emails. The new cloud solution will also connect to proprietary data stored in Teradata’s Integrated Data Warehouse, which will allow email marketers to directly integrate their email and mobile data through Teradata Digital Marketing Center. Campaigns can also be connected to Teradata’s Marketing Resource Management Solution, which will allow marketers to analyze their efforts and better illustrate their campaign’s ROI. Teradata’s product announcement comes on the heels of new research revealing marketing organizations have not caught up with the advances of marketing technology. Only 29% of marketing departments have centralized data across channels and only 23% coordinate cross-channel marketing, according to a new study of email marketers released today by The Relevancy Group and Epsilon. The study also revealed that email marketers are looking for better database management solutions. When asked what services would deliver the greatest value, the top ranking response was analytical services to develop measurement and attribution models (40%). This was followed by strategic services that optimize marketing programs (36%), recommendation algorithms (33%), and audience trend identification capabilities (31%). Optimizing communication through greater use of analytics was the highest ranking priority to improve email marketing ROI in 2015, with 34% of respondents.